One of my favorite kimchi in spring days has to be the green onion kimchi. Yes, you can make kimchi with green onions (aka scallions). 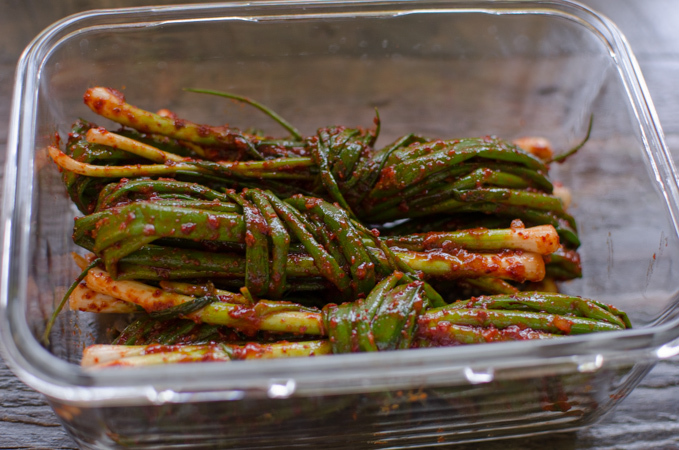 This green onion kimchi is called Pa-kimchi (파김치) in Korea. For some reason cabbage kimchi is not as tasty as it should be for me during warm season, mainly because cabbages taste better in cold weather. Koreans look for different vegetables to make kimchi with during spring and summer. Cucumber kimchi, bean sprout kimchi, and perilla leaf kimchi are some of the few great choices among them. 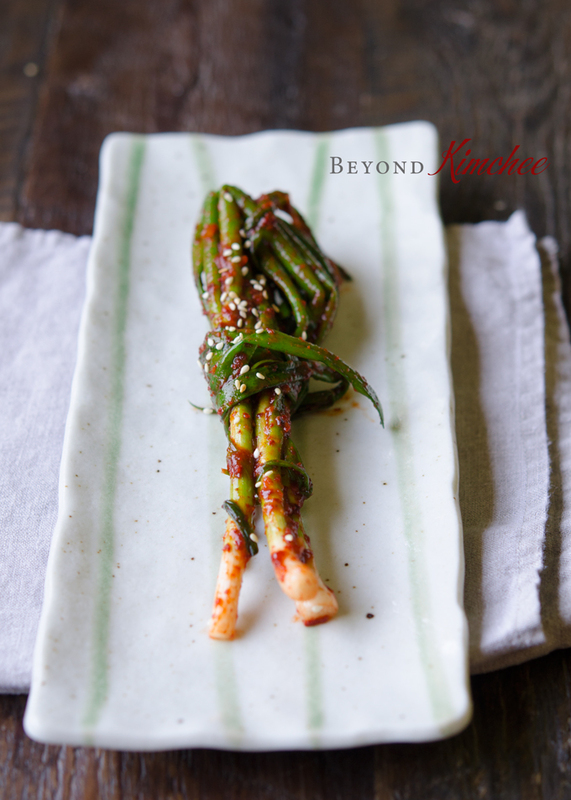 I planted some green onion seeds in my backyard in early spring, and before I knew it, I was able to harvest the tender petite green onion which is perfect to make kimchi with. I would recommend to look for skinny green onions rather than the gigantic thick ones for this recipe. 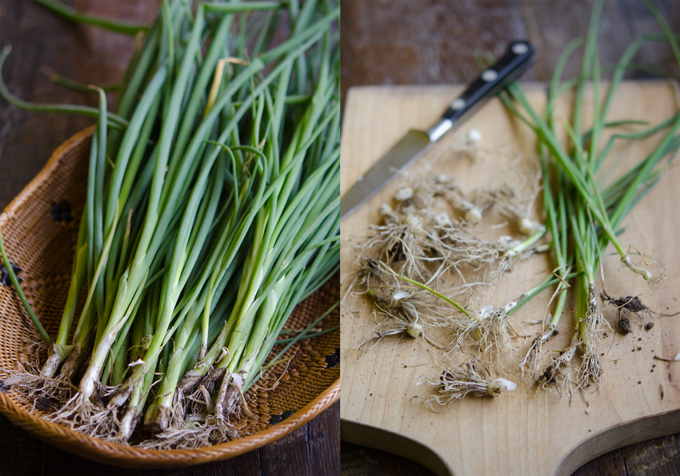 Petite green onions are tender and yield sweeter after taste. Clean and trim your green onion and place in a baking sheet. Sprinkle 2 tablespoon of anchovy sauce over white part of onions, and toss to coat. Let them sit while you are getting the rest of the ingredients ready. Mix 1 tablespoon sweet rice flour (mochiko) with some water and let it cook until thicken. This is the rice glue. In a bowl mix Korean chili flakes, sugar, garlic, ginger, the remaining anchovy sauce, and the rice glue. 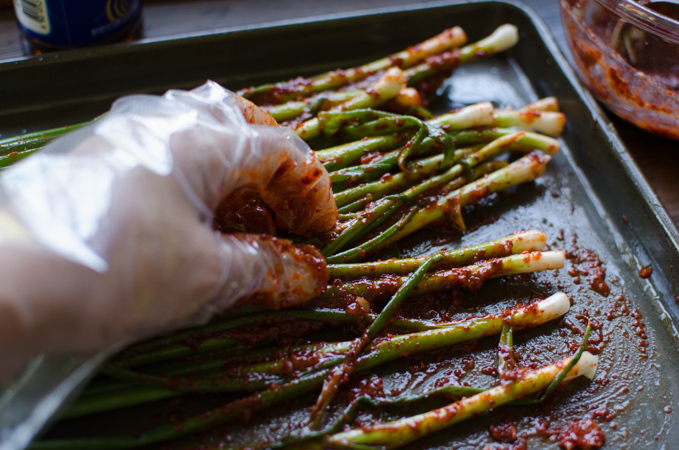 Spread the chili paste onto green onion all over with your fingers, turning and tossing. Take 3-4 green onions and fold, wrap with the green parts to make a bundle and to secure. Place in a airtight container and let them ferment in a room temperature for 1-2 days, then store in the refrigerator for another 3-4 days before you serve. 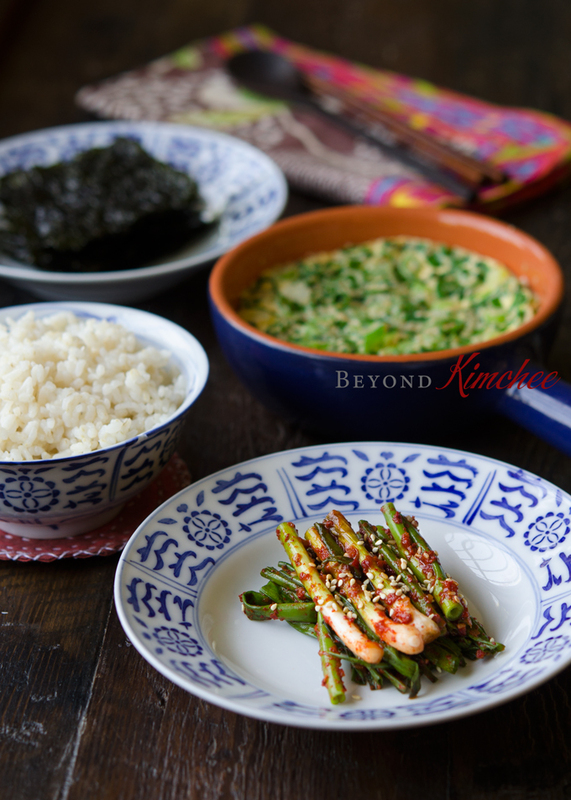 A few strips of green onion kimchi is screaming for a bowl of rice…! Green onions are cheap, available everywhere, and they are good for you. 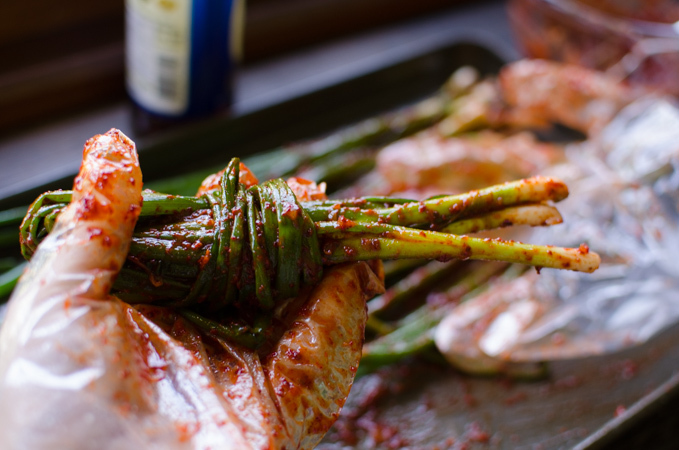 So why not make some into kimchi to impress someone who is a Korean food lover? But…. I have to tell you that green onion kimchi is quite potent once fermented. As with other onions, too much consumption in one seating can make your breath unpleasant afterward. I thought I better let you know so that you can prepare yourself accordingly in case you are serving this kimchi to your date. 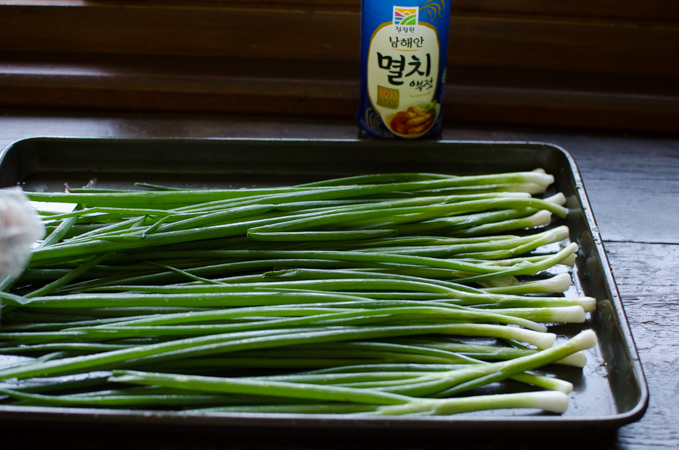 Green onions can made into wonderful kimchi very quickly. Perfect kimchi for spring time! Place green onions on a baking sheet, sprinkle 2 tablespoon of anchovy sauce over white part of green onions. Toss to coat and set a side. 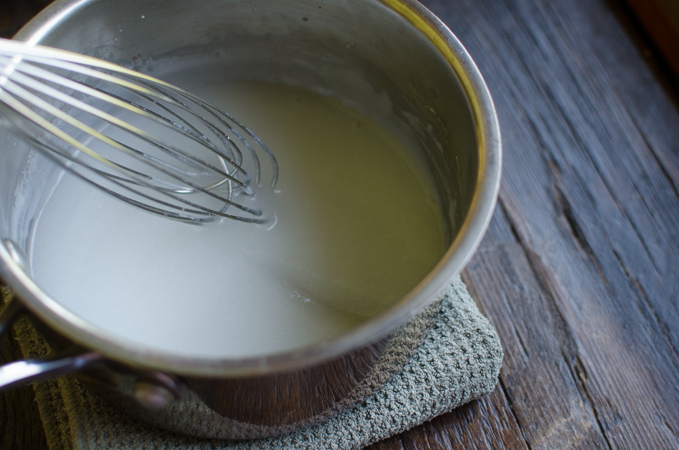 In a small sauce pan, mix sweet rice flour with water. Cook the mixture until it thickens whisking constantly over medium heat. Set aside to cool down a little. 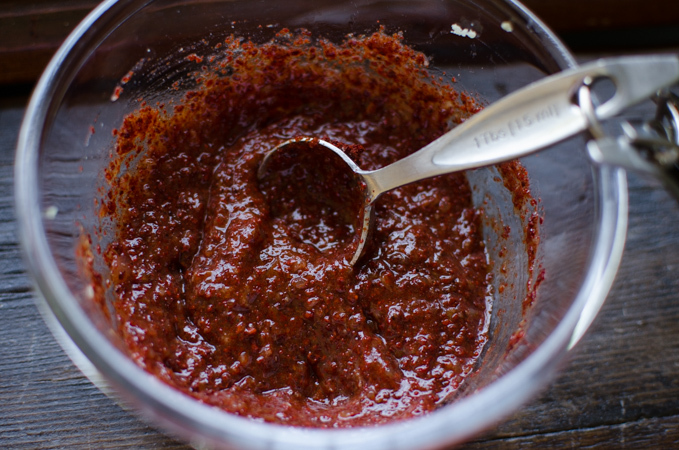 In a small mixing bowl, mix chili flakes, sugar, the remaining anchovy sauce, garlic, ginger, and corn syrup if using. Spread the chili paste onto green onion all over. Take 3-4 green onions and fold, wrap around with green parts to secure into bundles. Put the bundles into an airtight container and let it ferment in a room temperature for 1- 2 days, then store in the refrigerator for 3-4 days before you eat. You an serve the kimchi as a whole piece or cut into 2 -inch slices. Serve as a side dish with rice and main dish. Yum! 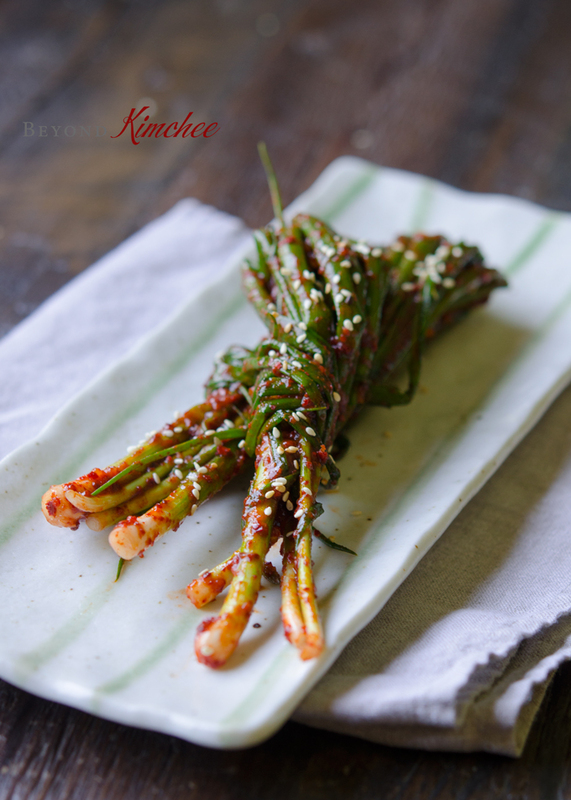 I never tried making kimchi from green onion, what a great idea! PS I love how you wrapped the green onions in a knot! Holly, one of my faves!!! beautiful!!! haha this look so delicious!! I have still to try my hands at making homemade kimchi and i think this is perfect! One question though Can I chop the green onions in smaller pieces and what's rice glue?? Any substitutions? Yes, you can chop the green onion into smaller pieces. Rice glue is boiled rice flour in water. You can substitute with cooked plain white rice. Just puree 2 tablespoons of cooked rice with 1/2 cup of water until very smooth. Wow! Your kimchi looks so fresh and delicious! Perfect for this time of year. By "Anchovy Sauce", do you mean fish sauce? This looks great and I must try it! Yes, you can use fish sauce. Can you recommend a vegan alternative to the anchovy sauce? Try Korean soy sauce for soup. You can find more information about this sauce in my "Korean Pantry" tab on the navigation bar above. what red chile flakes do you recommend? would Wang's be a good choice? Question: When I make this I let the onions ferment at room temperature for several weeks, then store it in the fridge pretty much forever. Is this just me being lazy/extreme or is this sort of thing done in Korea? Thanks! several weeks sounds way too long. Green onion doesn't need to ferment in the room temperature that long. Just a couple of days and then store in the fridge until they are eaten all.